Around 100 healthcare professionals descended on London for the 2018 Encephalitis Conference on December 3. Speakers and attendees from around the world were on hand for the go-to conference for encephalitis experts, including Professor Josep Dalmau – who discovered 10 autoimmune diseases, including Anti-NMDAR Encephalitis – and Dr Susan Hills, a Medical Epidemiologist in the Division of Vector-Borne Disease at the United States Centers for Disease Control and Prevention. They shared the stage with a host of international speakers who talked about different aspects of encephalitis from epidemiology, diagnosis and treatment to neuropsychological and social outcomes of encephalitis. A full report of the conference will follow in due course. Raia Blum, Department of Neurology, Icahn School of Medicine at Mount Sinai Hospital in New York: Analysis of Psychosical Outcomes of Autoimmune and Infectious Encephalitis. Amanda Tomlinson, Department of Neurology, Icahn School of Medicine at Mount Sinai Hospital in New York: Assessment of Care Transitions and Caregiver Burden in Autoimmune and Infectious Encephalitis. Dr James Varley, Oxford Autoimmune Neurology Group, Nuffield Department of Clinical Neurosciences, University of Oxford: Contactin-associated protein 2 (CASPR2) antibody mediated neurological disease is associated with a distinct human leukocyte antigen. 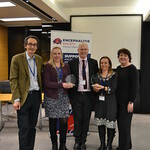 Meanwhile, there were also awards for Excellence in Encephalitis Healthcare for Dr Sylviane Defres and Hayley Hardwick, ENCEPH-UK, Institute of Infection and Global Health, Liverpool, for their work as project leaders on the Enceph UK study.